Cardboard Gallery is born out of ongoing questioning around how to exhibit art today. We recognised the street as a free space where anyone could participate enabling all audiences and allowing artists to show their work to the public. Why cardboard? It belongs to the street. It belongs to this century where it is used daily. It is thrown away, recycled, burned, used as mulching, turned into furniture and turned into gold. It withholds a universal quality, cardboard belongs to the world. In the urban world one can find cardboard boxes on the street. As artists we were challenged by the problem of how to exhibit art in the streets. Using cardboard allows integration with the street environment. We were able to show art in a way that it was well displayed using materials that blended in with the surroundings. Cardboard Gallery is a living exhibition: a working unit, a timeless space in the middle of Bristol. 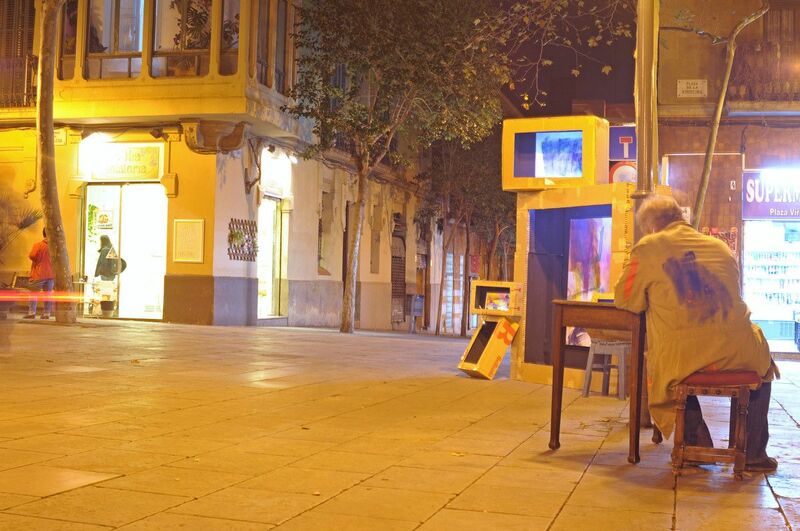 Installation works, paintings, a wall of cardboard boxes for displaying art work, street interventions using cardboard, artists working, structural towers displaying paintings, a live video installation and a painting workshop open to the public will all contribute to the process. The painting workshop open daily has a character of adventure. It is meant to show guest artists and the general public the many possibilities of using cardboard.